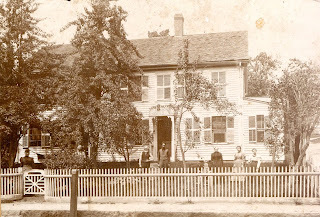 We thought you might like this September 18, 1894 picture of what was at the time one of the Allen houses in Fiskdale. Now it's Rovezzi's Restaurant. I think I can name a few of the people in the picture of the house which is now Rovezzi's. On the back of the picture is the name Alice A. George. Alice Annie George married William Aldrrich Allen, who I suspect is the younger man in the photograph. Standing next to him, I'm guessing is "Grandpa" Allen (William Liberty Allen). They were wonderful people. 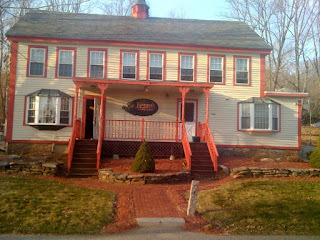 The old house in the picture, is now known as Rovezzi's Restaurant in Fiskdale. Written on the back of the picture is "Alice Annie George, 1894." She was my dearest friend many, many years later (beginning when she was about 80 years old and I was only 8). Alice and her family lived in the house pictured here. I suspect that the two men in the center front of the photograph are William Liberty Allen and his son William Aldrich Allen. The older woman in the picture must be Alice's mother, as she looks like Alice did when she grew older. I am not sure which young lady is Alice. She wasn't very tall, so I'm thinking that she must be the shortest of the women on the right. When Alice was a young girl, she and her sister Minnie went to North Dakota homesteading with their parents, and it was so cold that the water bucket in the kitchen would be frozen solid when they got up in the morning. I guess they didn't stay too long, because here they are in the picture. The Allen family lived in the first house after Cartier's corner, where Old Stagecoach Road is today. The house burned a couple years ago, but the original little section on the end is still there with a new house on the old foundation. Alice eventually married William Aldrich Allen, quite a smart young man, who spoke beautiful French for a Yankee, and who was the pharmacist at Blackington's Drug Store (Blackington Building, Fiskdale). He was promised that Alice would always get her heart medicine (Digitalis) at the price of 50 cents. After Will (William Aldrich Allen) died and the pharmacy had changed hands a couple times or more, I (about 12 years old or so) went down with 50 cents in my hand to pick up Alice's medicine - but the bill on the package was much more than 50 cents. I told the new pharmacy owner of the promise to Will by Mr. Blackington, and he explained that he couldn't afford to honor that promise...and that he would have to raise the price...and then he said, he could do it for 65 cents! Still a good deal, don't you think? Thank you, Raoul and Marilyn for sharing your memories with us.---ed. I remember way back when...Alice Allen belonged to the D.A.R. (Daughters of the American Repbulic) and the Womens' Relief Corps. Back in the 1950's Bessie Ballard (who lived in the house on Brookfield Road, right at the end of Clark Road), picked up Mrs. Allen and they brought food to the town hall for the marchers on Memorial Day. Even when Alice was home alone, up on the hill near the end of what is now named Old Stagecoach Rd., she would have a flag in a vase on Memorial Day. Favorite snacks at Mrs. Allen's in the 1950's were Snicker Doodles, Coffee Jelly (dark, sweet, coffee gelatin dessert), and hot lemonade. One of her favorite meals was Finnan Haddie and vegetables. She fried food in the "spiders" and we put out feet up on the "crickets."